FORT COLLINS, COLORADO – Astronauts aboard the International Space Station (ISS) conduct research, fix equipment, perform space walks … and they vacuum. A portable air quality sampler based on the "TPS100 (thermophoretic sampler)," a device developed collaboratively by Pittsburgh's RJ Lee Group and CSU, will soon take a ride up to the ISS. The sampler is based on proof-of-concept work performed in the lab of John Volckens, professor of mechanical engineering and CSU Energy Institute researcher. The TPS100 is manufactured and sold by RJ Lee Group, an analytical microscopy company. The launch is slated for Oct. 9 (subject to change). NASA will conduct a series of air sampling sessions in the American modules of the ISS to collect airborne particles, then return them to Earth for analysis and identification. "When you hear the words 'dust in space' you probably think about fragments of meteorites or other cosmic material," Volckens said. "It turns out that [the air inside] space stations gets dusty, just like our homes here on Earth, from humans living there." Through mutual colleagues, Volckens connected with scientists at RJ Lee Group, including senior scientist Gary Casuccio, and they formed a partnership to develop a commercially viable product around the core discoveries of Volckens' original research. CSU Ventures helped the scientists license the technology to RJ Lee Group, and the CSU researchers have continued offering technical and scientific support. Dan Miller-Lionberg, who received a master's in engineering from CSU, was the principal mechanical designer of the TPS100, and currently works half-time in Volckens' lab and half for Volckens' startup company, Access Sensor Technologies (co-founded with Chuck Henry, chair of the Department of Chemistry). 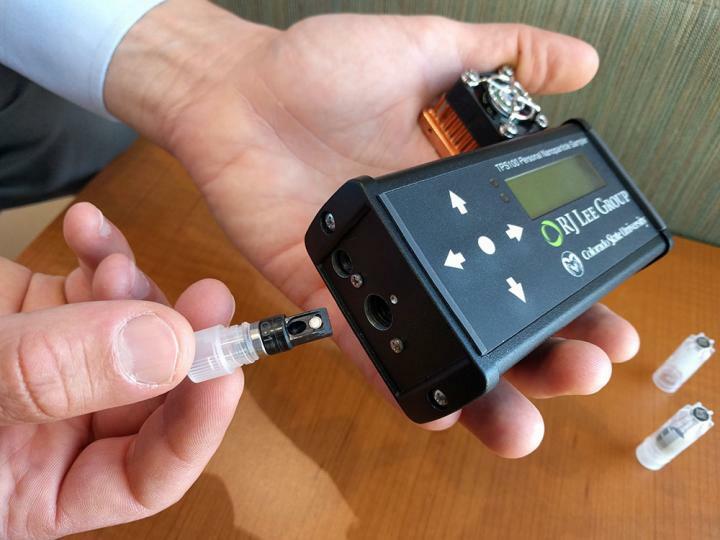 "Simply put, this technology is ideally suited to meet NASA's needs for particle sampling and characterization in a lightweight, portable package," Miller-Lionberg said. "One of the nice things about the sampler is that it collects directly onto an electron microscopy grid, so there is no sample prep required," Casuccio said. "The RJ Lee Group had an ideal sampler I was looking for in the TPS100: a portable collection device based on an operating principle that is compatible with low gravity," Meyer said. Meyer noted that data on the size and nature of airborne particles on the ISS is limited to relatively large particles that have shown up in vacuum bags. Her hope is that the TPS sampler will give NASA a clearer understanding of the ISS' air quality, with the goal of astronaut safety and wellness.